As your eyes adjust to the dark inside the former forge warehouse on Morrison Drive, you might notice the old photo booth, stained glass church windows, or a row of five top hats hanging above the stage. Certainly it’s hard to miss the vintage painting of a naked blonde, lying on her side, her back to the artist. Let’s get one thing straight: The Royal American is a self-aware, quirky dive bar of the highest order. Calling it effortlessly cool is probably going a bit too far, as obviously a lot of effort has gone into curating the idiosyncratic relics, but it’s got a hip, self-effacing vibe that’s hard to resist. The low-key drinking establishment and live music venue also serves food, and — leaning heavily on the input of the long-time bartender/consigliere — the feast began with crispy Brussels sprouts ($8). The contemporary version of the fried mushroom, the bowl of halved cabbages arrives dressed in a sweet, yet vinegary “wam bam sauce.” Although the menu mentions cilantro and mint, the only other element present were the crispy onion bits. While the promised herbs certainly would have been welcome, it’s still a tasty way to up your caloric intake. The Disco Fries ($10) could send you directly into a disco nap, as the portion borders on obscene. A huge plate is piled high with shoestring fries, then drizzled with both white cheese sauce and brown gravy. New Jersey’s answer to poutine, the indulgence usually stops there. 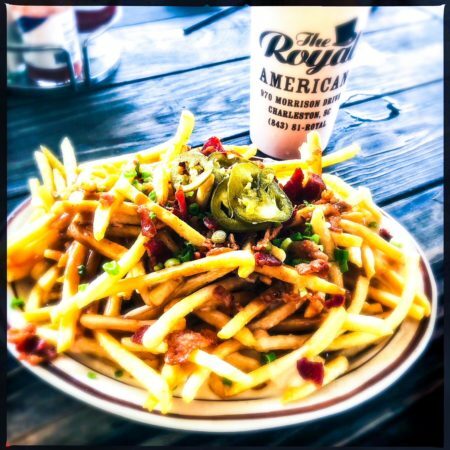 However, The Royal American’s version is then topped with bacon bits, scallions, and pickled jalapeños, bringing it a little bit into loaded baked potato country. A good idea on paper, the processed cheese sauce doesn’t mix well with the gravy, a thin, dark concoction with a jarringly sweet flavor. However, this evaluation also includes the assumption that you’re sober. Or care about anything more than consuming an imprudent amount of satisfyingly greasy food on the cheap. While we’re talking about the gravy, let’s just get the Loco Moco ($12) conversation out of the way. 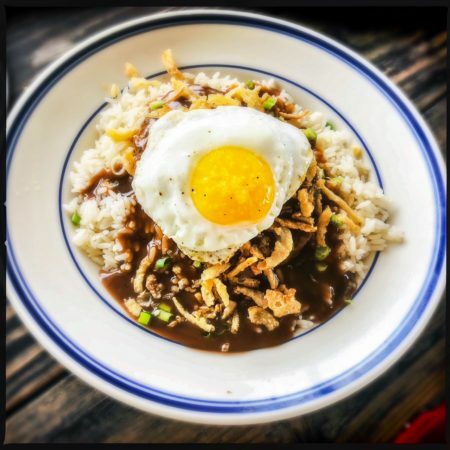 A traditional Hawaiian plate lunch offering, even when done well it’s unconventional; a hamburger patty is served on a bed of white rice and finished with a fried egg and brown gravy. “What is this doing in a bar in South Carolina?” wondered my dining companion, to which the only answer is “nothing good.” The Royal’s version immediately starts to go off the rails with the rice. Then, the distinctive converted Uncle Ben’s-style grains are drenched in the same, sweet school lunch gravy. Although there’s nothing wrong with the hamburger patty or the egg, all in all, it’s a disappointment whether you’re familiar with the better versions of the dish or not. Happily, there’s the Music City hot shrimp ($12) to make it all better. Served with bamboo skewers, a dozen or so plump shrimp are battered and perfectly fried. Drizzled with chili oil and a decadent herb aioli, it’s spicy — but not too spicy — and bound to elicit moans of pleasure. Get yourself an order to soak up a giant plastic cupful of the bar’s infamous rum punch ($8), a fruity, coconutty bargain that may or may not later manifest as a raging hangover. Results vary. 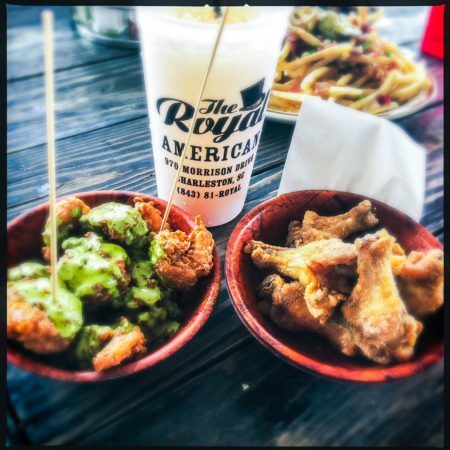 Royal proudly declares itself a dive bar, and accordingly also offers a variety of cocktails, a smattering of draft beers, and an extensive list of canned brews, as well as white, red, or rose in a can. Likewise, service could pretty much be described as ‘serve yourself,’ and probably a sign or two might help first-timers. As we dined, a couple arrived, took a seat at the outdoor table and waited about 10 minutes … before leaving in a huff. Head to the bar to request a menu, put in an order, and later to help ferry your food when the red buzzer dealio goes off. On the sandwich side of the spectrum, the veggie melt ($9) offers vegetarians — or whomever — a meat-free version of the American diner classic. 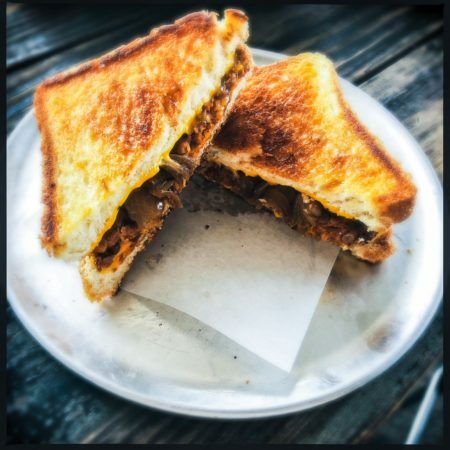 It’s made with Texas toast, grilled onions, and American cheese, rendering it exactly like the burger version on the other side of the menu, except for the bean-based ‘signature veggie patty.’ It gets a little mushy and would benefit from being deep fried or cooked to a firmer crust, but is still a flavorful pick, even by my meat-loving partner’s standards. 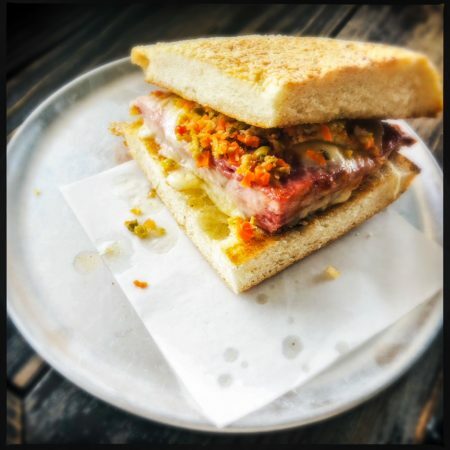 Similarly, the muffuletta ($9) is a solid choice. 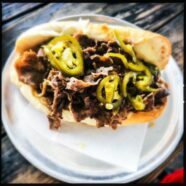 The traditional New Orleans offering is cut down from it’s typical beastly dimensions and served on a quarter-portion of a round seeded loaf. Commonly made with equal allocations of capicola, mortadella, and salami, as well as mozzarella, and provolone, Royal’s version offers a 4:1 ratio of ham to salami and a couple slices of provolone. The loaf is covered with a chunky olive salad, rendering it a not-quite-authentic, but certainly authentic-enough taste of The Big Easy. Although the traditional (admittedly pricey) ribeye has been substituted with thinly sliced sirloin, the Philly Cheesesteak ($10) is a fitting tribute to its namesake as well. Seeing as the Philly-based Amoroso rolls can now be found in most grocery stores — and that version just isn’t quite the same — this Massachusetts-made Piantedosi roll is clearly fresh and a worthy substitution. Soft and chewy, the white American cheese and grilled onions add another nod to the classic. Pickled jalapenos do not, but to each his own. First, foremost, and predominantly a bar, and then a live music venue, The Royal American probably isn’t going to become the next hot dining destination. And that’s just fine. Whether there to catch a show, overindulge in the notorious rum (or vodka or bourbon) punches, or take in the wonderfully weird ambiance, you can also count on mostly solid bar food, and even a few stellar culinary moments like the Music City hot shrimp.